Welcome to Part 2 of the ongoing drama. So far, Michael ‘Enoch’ Peinovich and his supporters have been frantically trying to channel all the discussions about his standing in the western ethno-nationalist scene toward his Jewish wife, Ames Friedman, as though the problem is confined only to her and as though the perniciousness and hypocrisies of these revelations can be mitigated by simply removing her from the situation through divorce. They have been resolutely ignoring the manifest high likelihood of Peinovich himself being Jewish, at least through his father’s side. But while people were grappling with that revelation, there is another secret lurking behind that. As it turns out, Peinovich is additionally Jewish through his mother’s side. Seriously. This is actual reality. This is really happening. Read that sentence again, and consider the implications of it. Peinovich is around and about 75% Jewish at least. Utilising the information that the first doxxing was able to dredge up, we were able to use that information to pivot across various branches of his family, including his siblings, but the most important link is that of his birth-mother. Michael ‘Enoch’ Peinovich’s father is Michael P. Peinovich. Peinovich senior is married to Billie Gleissner, but we have not taken the time to deeply examine Gleissner, because Gleissner is not Michael ‘Enoch’ Peinovich’s birth-mother. Rather, Gleissner is his step-mother. Michael ‘Enoch’ Peinovich’s father and his step-mother Billie Gleissner married each other in 1983. So who then, is Peinovich’s birth-mother? We discovered that Michael ‘Enoch’ Peinovich’s birth-mother is Paula Sippel. Prior to 1983 she was known as Paula Enockson Peinovich-Sippel, her surname through her mother’s side is Enockson. That is the maternal name, which is likely the source of the nickname ‘Enoch’ which Michael ‘Enoch’ Peinovich is using literally in plain view. Sometimes it’s the thing which is in plain view which paradoxically garners the least attention. We know that Michael ‘Enoch’ Peinovich’s father gets the name Peinovich from a Russified and Americanised variant of the Croatian name Pejnovic, and that the name is associated with Jewish demographies in Croatia. We also know that Peinovich’s father married twice, and that in both cases he married women with Jewish surnames: Paula Enockson Peinovich-Sippel, and Billie Gleissner. Additionally, we know that Peinovich’s mother carries the name Enockson through her own mother’s side of their family. And then, to top it all off, Michael ‘Enoch’ Peinovich ‘accidentally’ married a Jewish woman himself, Ames Friedman, the woman who is now at the centre of this recent Alt-Right scandal along with Michael ‘Enoch’ Peinovich. Even the most sceptical people, in their heart of hearts, in their intuition, they know that there must be something there. There’s something. But they won’t admit it to themselves. Is it because of a cult of personality? The most popular narrative among the sobbing defenders of Peinovich is that the people who are most viciously attacking TRS in the wake of this scandal, are people who have something to gain from bringing down TRS. Okay, sure. Let’s be real here. TRS, the ‘inner party’, and the Alt-Right leadership core all got caught covering up a massive den of hypocrisy and money-grubbing deception at TRS, and they piled lies on top of lies within lies. Michael ‘Enoch’ Peinovich had absolutely laughably ineffective OpSec, and as such it was possible to get his personal information and to discover everything about the fraud he was perpetrating. It was also possible to pivot across his family tree because his whole family maintained an ostentatious social media presence which could be easily dredged in the aftermath of the doxxing. If you get caught doing something that you’re not supposed to be doing, and there is a good strategic reason for me to amplify the exposure of that scandal, then I will amplify it. The TRS crowd desperately wants to call all of this ‘purity spiralling’ and thereby they hope to place a lid on the ongoing scandal. I don’t call it ‘purity spiralling’. I call it ‘actually tackling the problem of Jewish subversion’. Does this sound extreme? Some people are saying that the stance taken by the anti-TRS people such as myself, is ‘more extreme than Adolf Hitler’. Nothing could be further from the truth. Even someone such as George H.W. Bush would have purged someone like Michael ‘Enoch’ Enockson Peinovich-Sippel just as fast, if Bush had been able to have his way. [...] For the first 45 years of Israel’s existence, the Republican Party was deeply divided when it came to the Middle East. Powerful forces inside the GOP had long been at best uncomfortable with Israel and at worst openly hostile. Those forces included big businessmen and oilmen with deep connections and interests in Arab lands and so-called foreign-policy realists who did not see why the U.S. should maintain a special relationship with a tiny, economically negligible country surrounded by 22 Arab nations that wished it would disappear. Following Reagan’s lead and influenced by the neoconservatives who had gravitated to the GOP, pro-Israel voices became more confident in expressing their view of the ties that bound the United States and the Jewish state—the same monotheistic roots, which disposed them to an appreciation for human dignity and self-determination, and a shared belief in a covenantal founding of both nations. This view helped the GOP establish an ideological framework for foreign policy beyond the binary question of Communist versus anti-Communist. None of this was seamless. Reagan was succeeded by George H.W. Bush, himself quite literally a Country Club Republican and oilman by birth and occupation and a foreign-policy realist by disposition. He famously complained about the Israel lobby, saying ludicrously that he, the president, was “one lonely guy” up against “some powerful political forces” made up of “a thousand lobbyists on the Hill.” His secretary of state, James Baker, was even worse, earning the wrong kind of immortality with his line, “F— the Jews, they don’t vote for us anyway.” Even as these attacks were going on, there were signs that Bush had already become an anachronism in a rapidly changing world—most notably the fact that the Baker line was leaked to the press by his disgusted fellow cabinet secretary Jack Kemp, a key figure in remaking the party as pro-Israel. Also, objectively speaking, George H.W. Bush was better on trade issues than Donald Trump ever will be, and you will also find that unlike Donald Trump, George H.W. Bush was closer to a coherent global ethno-nationalist position, as seen in Bush’s stance on the Jewish Question, and in Bush’s stance on the defence of Eastern Europe and Central Asia from Russian colonial aggression. Really makes you think, doesn’t it? Maybe someone should clone Bush senior and bring him back to power? I’m just raising it as an interesting point so that people can consider the present situation in context. But hey, no, people like Mike Cernovich, Milo Yiannopolous, Paul Gottfried, Lauren Cherie Southern and Michael ‘Enoch’ Enockson Peinovich-Sippel bandied around some fashy-looking memes on Twitter and told people to give up on searching for their own candidates or building their own parties, and instead rallied people to throw in their lot with Donald Trump under various stylistic guises – ranging from one extreme which is ‘Gorilla Mindset book’, to the other extreme which is ‘favicon.ico is an open oven which is really edgy’ – and as a result the Alt-Right in the United States became incapable of identifying the very same Jews that they professed to be on guard against. The Alt-Right did however become very proficient at: (a.) supporting stupid protectionist trade policies to spite Asian manufacturers and prop up American oligarchical cronies, (b.) crafting insults that were calibrated to really annoy Hispanics, and (c.) supporting the slashing of (c, i.) their own health care provisions and (c, ii.) their own social security benefits, (d.) re-enabling the potential for a pointless future American war against Iran, and (e.) just as an extra bonus present for Israel they even managed to elevate Jared Kushner to the position of being literally the most powerful Jew to have ever inhaled oxygen in the universe. 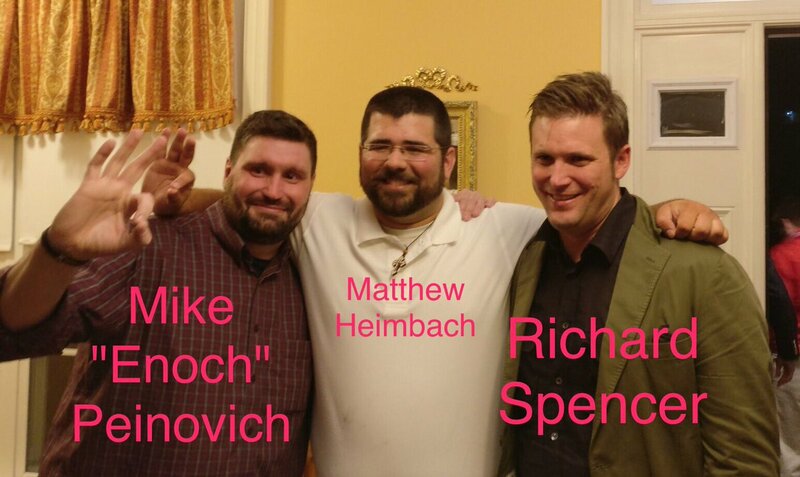 For an encore, performed live from the front deck of the Lusitania, the Alt-Right will probably next declare an undying support for Michael ‘Enoch’ Enockson Peinovich-Sippel, with some stupid excuse like “no punching to the right”, whatever that even means. Watch and see, that will happen!